Sturm, Ruger & Company, Inc. (NYSE-RGR) is proud to reintroduce the Hawkeye® Alaskan rifle chambered in three calibers: .375 Ruger, .338 Winchester Magnum and .300 Winchester Magnum. 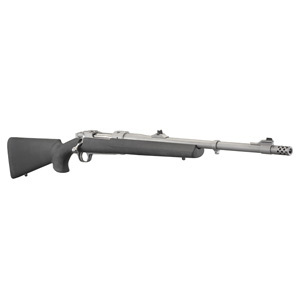 Based on the popular Ruger® Guide Gun platform, this stainless steel rifle, paired with a Hogue® OverMolded® stock, provides the avid shooter or hunter with the ultimate rugged and hard-hitting rifle. The rifle's black Hogue OverMolded synthetic stock is a unique feature to the Alaskan configuration of Hawkeye rifles. Hogue's patented OverMolding process provides the ultimate comfortable, non-slip, cobblestone texture that is soft, yet durable. The state-of-the-art elastomer material used on Hogue stocks will not harden with age and is virtually impervious to all oils and solvents used with firearms, providing years of dependable service. The stock also comes equipped with standard sling swivel studs and a highly effective recoil pad. The Hawkeye Alaskan weighs eight pounds and has an overall length of 42 inches, a matte stainless finish and a windage-adjustable shallow V-notch rear sight and large white bead front sight. 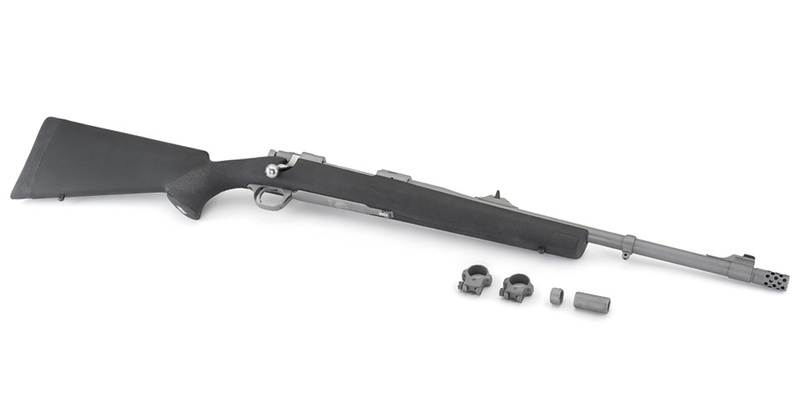 The rifle also features the Ruger Muzzle Brake System that includes a removable, radial-port muzzle brake to significantly reduce felt recoil. The Hawkeye Alaskan rifle features the smooth and crisp LC6™ trigger, three-position safety and integral scope mounts for included scope rings. The hinged solid-steel floorplate bears the distinctive Ruger logo and provides easy unloading while eliminating accidental dumping of cartridges. Like all Hawkeye rifles, these Alaskan models also feature a non-rotating, Mauser-type controlled round feed extractor. For more information on the Hawkeye Alaskan or to learn more about the extensive line of award-winning Ruger firearms, visit Ruger.com or Facebook.com/Ruger. To find accessories for the Hawkeye and other Ruger firearms, visit ShopRuger.com or your local independent retailer of Ruger firearms.